With ISA International Sign Expo 2014 in full swing this week in Orlando– Almo Pro A/V took advantage of the convergence of some 17,000 sign industry professionals at the Orange County Convention Center for ISA, to host its E4 conference yesterday. of media players and discuss the advantages and disadvantages of each type. E4, which is a one-day free event for Almo Pro A/V’s reseller, integrator and consultant partners– and for this E4 also ISA expo guests– did indeed include a special focus on Digital Signage, with keynotes and special panels devoted to the fastest growing sector of the AV market, and several formal presentations/training sessions on digital signage topics including “Content Creation for Digital Signage” from Almo’s new Content Creation Team (Almo launched its new digital signage content services for AV integrators earlier this year), “Demystifying Media Players for Digital Signage” from Jonathan Brawn, and “The Art of ‘Techorating’ with Displays for Commercial Applications” from Alan Brawn. Other digital signage related activities included a session on “Video Walls: A Start to Finish Guide for Success” that was presented by NEC, and an examination of “Assessing Network Readiness for AV Systems” that was held by InfoComm International. Content Creation services for AV integrators, at the E4 event in Orlando. 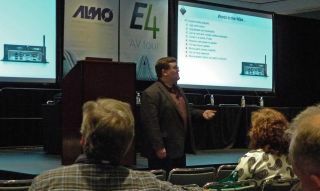 An interesting addition to the E4 curriculum this time, was Tom Stimson, one of the AV industry’s top Consultants, with a long track record of helping AV providers hone their business models and operations to increase their competitive stance and profitability. Stimson pulls no punches and drills down deep into financial, management, and sales best practices to companies move from being “busy” to being more profitable. His presentation yesterday, “How to Compete Against Old-School AV Dealers” was really a primer on how the industry is moving away from the old “dealer” model in AV. Stimson explained how because old-school AV has focused on products for too long, attempts to add service contracts and managed services have failed to capture alternative revenue for the AV Integrator because these services are dependent upon the product sale. And that the new competitors – IT, Telecom, Structured Cabling, and Electrical – are more than happy to leverage their advantages against the struggling AV Integrator. The solution is not business as usual– AV can’t sell its way back to profitability without modernizing the basic business model, according to Stimson. In the seminar, Stimson explained the updated business model that will keep integrators from losing market share. The E4 event in Orlando ended with a special Digital Signage panel session moderated by Gary Kayye, featuring Digital Signage magazine Executive Editor David Keene, Richard Ventura, North American Sales Manager for Retail Solutions at NEC Display Solutions of America; Carol Nordin President of TouchSystems; Brian Rhatigan, Business Development Manager at Almo Professional AV; and Jonathan Brawn, principal of Brawn Consulting. The session focused on question from the audience from Almo integration partners, and some guests from the traditional signage market who were attending the ISA expo. Some of the lively topics included choosing digital signage content management software, finding the right integration or manufacturer partner for selling or deploying digital signage, the growth of the market, and a projection of what digital signage will look like five years from now. Almo’s E4 has more stops this year, in Boston and Washington DC– both of those in October.